Uploaded by On Lok on 2017-06-20. 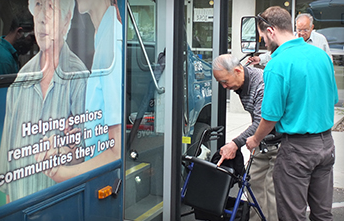 Every day, On Lok touches the lives of thousands of seniors throughout the Bay Area. Our loving and compassionate staff partner with families and caregivers to provide support, enabling our seniors to live in the community for as long as possible. For over forty-five years, the quality of life of our families has been positively impacted in numerous ways. With your help, we would like to capture and record your memories and experiences and share them with our community. On Lok invites our participants, seniors, families, caregivers, and staff to share stories of how On Lok has benefited the seniors in our lives. Feedback can be submitted by e-mail or U.S. mail, or in person at one of our centers. Once received, we will share your input on our website and other materials as a way to publicly recognize everyone’s efforts and experiences. Thank you for sharing your fond memories and experiences from On Lok!